Spring is almost here, and that means it's time to start planning the vegetable garden, buy seeds, and start your seedlings. My mom and I spent some of last weekend planting the seeds for two varietals of tomatoes, hot peppers, sweet bell peppers, broccoli and basil. This has been a tradition of ours for as long as I can remember. It still seems like magic to me, and pardon me if I sound trite, that you can plant a tiny seed in some soil and an entire plant will grow. And furthermore, that such a plant can produce fruit that we can eat. I like to remember how much of a miracle it is. For somebody like myself who is not particularly religious in a dogmatic sense, the workings of nature is my religion. With Spring just around the corner, it's life-affirming (in the most true meaning of the phrase) to take in and notice the growth of the plants and the new beginnings. 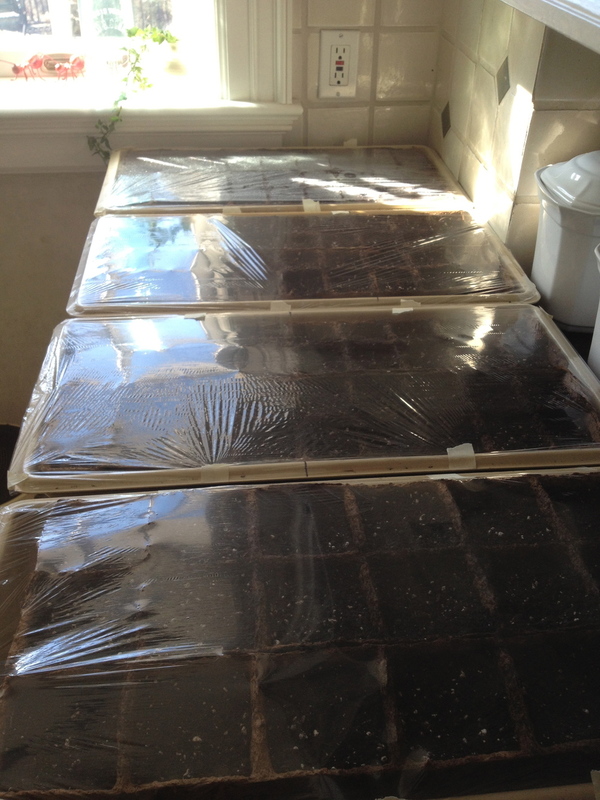 My mom bought seed starter cells made of peat. These little compartments are biodegradable, so you can plant them right into the garden. We filled the cells with organic compost based seed medium. If you want to grow organic vegetables, it is important that you purchase organic seeds and organic soil in addition to not using chemical pesticides on the growing plants. Wet the soil with a watering can or spray bottle so that it is moist but not exceedingly wet. Read the back of your seed packets to see what depth at which the seeds you are planting like to be planted. We used 1/4 inch for all of our seeds. 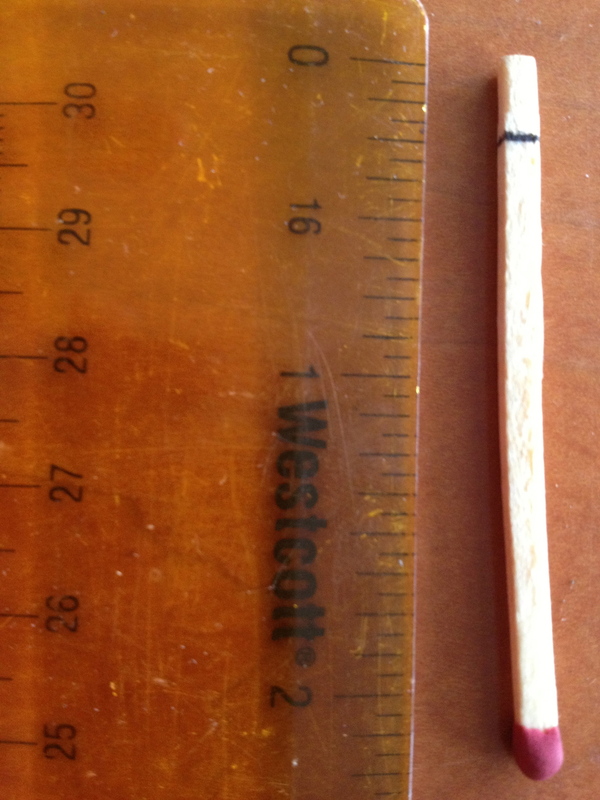 Take an ordinary match and use a ruler to measure 1/4 inch (or whatever your depth is) onto the match. The match is used to push the seeds down into the soil - if you stop at the line you've marked off, the seed is the perfect depth into the soil (see pictures below for a demonstration). Take your seeds and place them on top of the soil. Each type of seed will have different instructions as to how many seeds you'll put into each cell. For broccoli, for example, we used four seeds and we'll thin them (pick some out) when they start to grow. With tomatoes, you want to use one seed per cell. Use the match to push the seed down and then pinch gently with your fingers around the hole to cover the seeds. Tamp the soil down gently with your fingers so that there is no air around the seed. Most seedling trays come with a plastic cover that acts as a sort of greenhouse while the seeds are germinating/sprouting under the soil. We lost ours, so in the meantime we're using plastic wrap to create the same effect. My mom is going to buy some new bigger covers for when the sprouts grow taller. 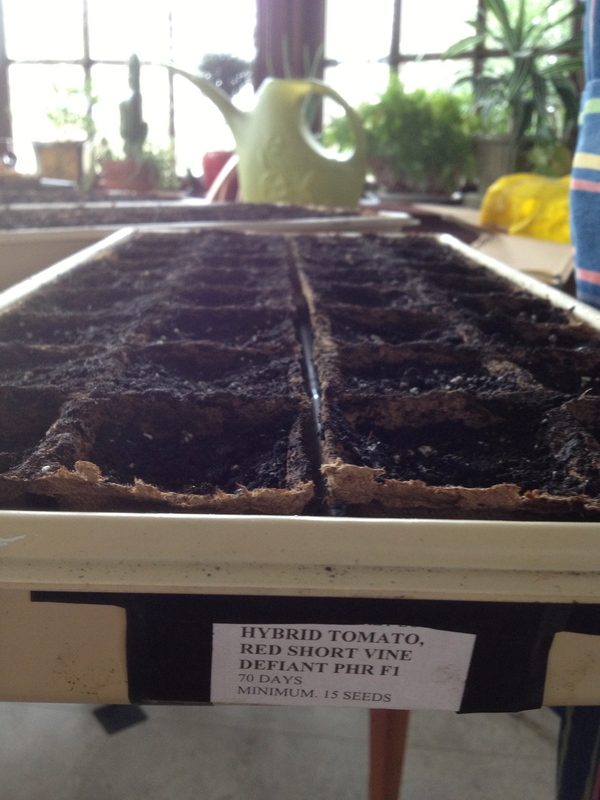 Take the seed packet, fold it, and tape it to the end of the tray so you know what you have planted and where. I will continue to keep you posted as the seedlings grow and we put them into the garden! I will also supplement these plants with some other varieties of seedlings from the nursery. Let's hope for a great garden in 2013!